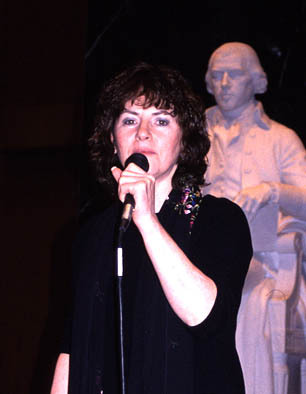 - Bridget Fitzgerald singing "Droimin Donn Dilis"
Traditional sean nós singing "represents the heart and soul of Irish­speaking people", as told by Bridget Fitzgerald. She was born and raised in a small village in the region of Connemara, the Irish­speaking area in county Galway, Ireland. It is from this region that her singing style of sean nós, or old­style Irish singing, originates. Although this traditional style of singing is generally melodically and rhythmically complex, subtleties vary by region, and it is highly individualistic. Singers generally sing unaccompanied, and lyrics are sung either in Irish Gaelic or in English in the sean nós style. Because Irish was the primary language in Fitzgerald's home when she was growing up, 50 percent of her repertoire is sung in Irish. Like many others in her village, she immigrated to the United States in 1964 as a young woman. She has been singing all her life and teaching and performing for more than 30 years. Michael O'Leary's interest in traditional Irish singing was first sparked when he lived in Ireland in 1978-79. Years later, he explains his passion as "an inexorable attraction that I can't fully explain; there's just something in me that wants to sing these songs". In 2003, Fitzgerald and O'Leary were awarded an MCC Traditional Arts Apprenticeship, an opportunity for Michael to "learn the deeper, almost ineffable, aspects of the tradition that come only from spending time in a master's presence".